Patients and methods: This is a descriptive, prospective and longitudinal study. 25 patients with indication of laparoscopic common bile duct exploration were included. The techniques for transcystic and choledochotomy approaches are described. Both of them were done using either a fluoroscopic guide basket or a 4mm choledochoscope. Conversion to an open procedure, operative time, complications, hospital stay and residual Lithiasis were the variables studied. Results: The Laparoscopic common bile duct exploration was successful in 80% of the cases. conversion to an open procedure was due to the presence of embedded stones into the duodenum and intrahepatic ducts stones. The transcystic approach was successful in 35%, while the approach through choledochotomy was done in 65%. Morbidity rate was 8% (2 patients), one patient with postoperative diarrhea due to the amount of contrast used for the cholangiogram, and one patient with a biliary leak after the T tube retrieval. Mean hospital stay were 3.5 days. Cases of residual lithiasis were not reported. 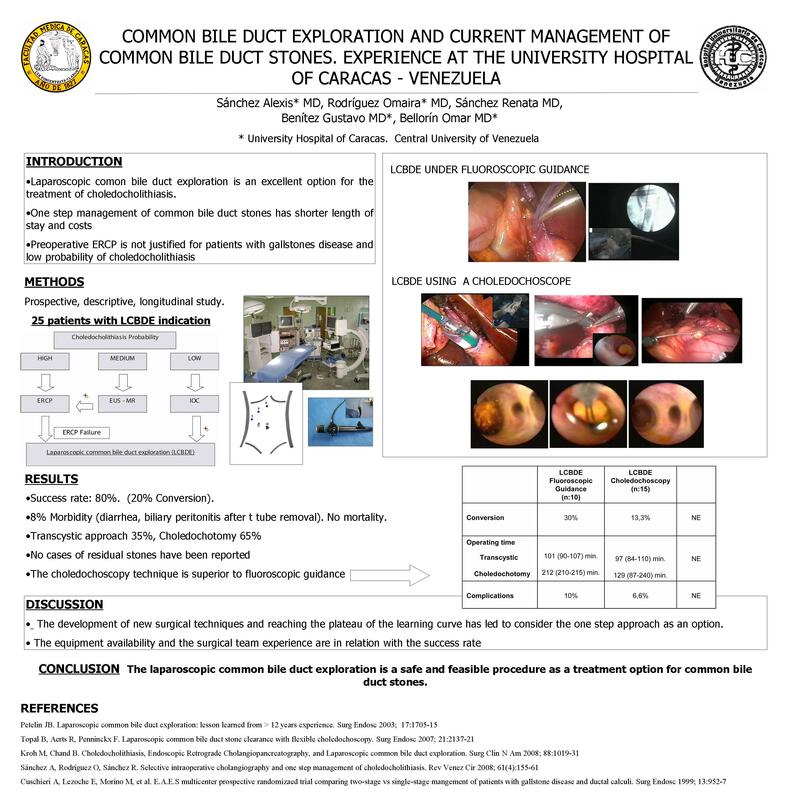 Conclusion: The Lapararoscopic common bile Duct exploration appears to be safe and feasible as a treatment option for common bile duct stones. However, the successful rate depends on laparoscopic and endoscopic skills from the surgical team as well as the availability of technology.